This is the message that pops up when I'm trying to save changes in the table...!! I'm logged into SQL Server with Windows authentication, server type as database engine and Server name as .\SQLExpress. Please give me a way to correct this problem or way to change the settings of the SQL Server... please give me a directions.. thank you.. 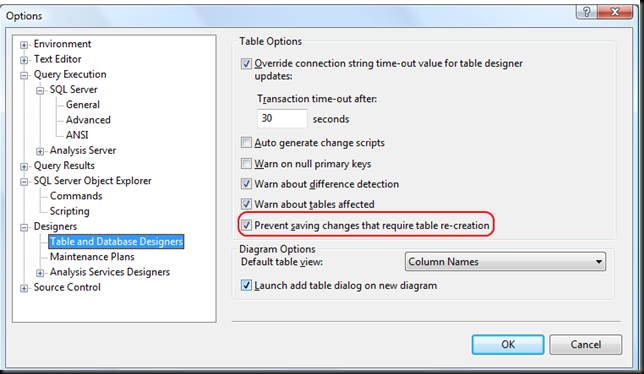 Although turning off this option can help you avoid re-creating a table, it can also lead to changes being lost. For example, suppose that you enable the Change Tracking feature in SQL Server 2008 to track changes to the table. When you perform an operation that causes the table to be re-created, you receive the error message that is mentioned in the "Symptoms" section. However, if you turn off this option, the existing change tracking information is deleted when the table is re-created. Therefore, we recommend that you do not work around this problem by turning off the option. Make sure your primary key column should not have any null values. After saving, repeat the proceudure to re-tick the box. This safe-guards against accidental data loss. When altering a column's datatype in the table Design view, when saving the changes the database drops the table internally and then re-creates a new one. *Your specific circumstances will not pose a consequence since your table is empty. I provide this explanation entirely to improve your understanding of the procedure. Any consequences when re-creating a table?